Zimbabwe’s Robert Mugabe has been pictured shaking hands with the country’s military chief a day after the army seized power. It has led to confusion over reports that the 93-year-old’s long rule was at an end. 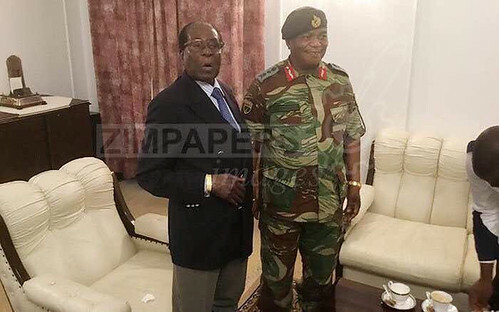 State-run media published photos of Mugabe meeting General Constantino Chiwenga at the president’s state offices and residence in the capital Harare on Thursday afternoon. He had unexpectedly driven from his compound to the venue. The pictures also included the defence minister and two South African envoys sent to mediate the crisis. The veteran leader – in power since 1980 – is insisting he remains Zimbabwe’s only legitimate ruler and is refusing to quit. But pressure is mounting on the former guerilla to accept offers of a graceful exit, according to sources. Earlier, the Reuters news agency cited intelligence sources who said the 93-year-old was resisting an attempt at mediation by a priest, following Wednesday’s military takeover. Opposition leader Morgan Tsvangirai called for Mugabe’s departure “in the interest of the people” in a statement read to reporters. Tsvangirai pointedly referred to him as “Mr Rogert Mugabe”, not president. 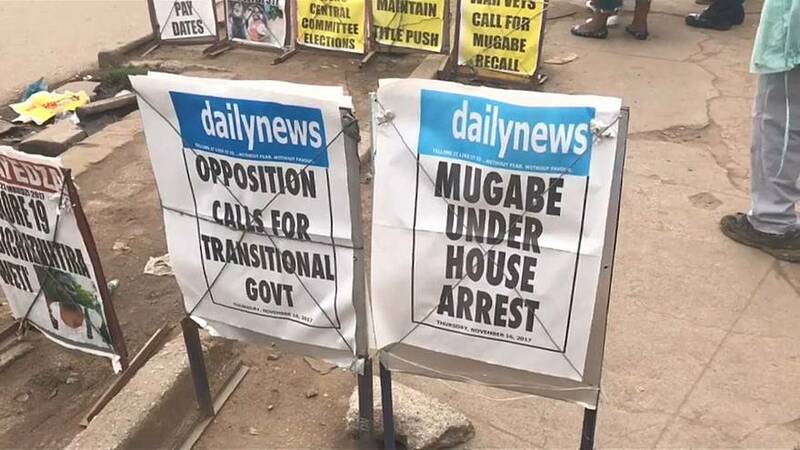 Mugabe and his family have been under house arrest, with the military saying it targeted what it calls “criminals” in the presidential entourage. Tendai Biti, an opposition leader and former finance minister, said: “Quite clearly the real issue now is how to we go back to our former, legitimate legal order. All eyes are also now on the vice-president who was ousted this month, Emmerson Mnangagwa, to see what role he may play in any political solution.